Postcard of Lordville Church when it was still at the end of the road! After a lapse of fifteen or sixteen years, Protestant services and Sunday school were again resumed in this village. During the last week in December 1894, Rev. John Anthony, an earnest Methodist minister then preaching in Equinunk, Penna., started a revival service in our midst. He was ably assisted by several of his church members, they coming night after night trying to do some home missionary work for the Lord. After laboring several days, Rev. Mr. Anthony secured the services of Miss E.M. White, a lady missionary, wholly consecrated to the service of the blessed Savior. She, with Rev. Anthony and the workers gathered around them, still continued to hold services for one week. During this week, the meetings were in the reading room of the Kilgour House and the Holy Spirit manifested itself in the conversion of several to the service of the Lord Jesus Christ. The newly converted ones feeling that they ought to do something along the line of Christian works - started a Sabbath School. The first session being held in the reading room of the Kilgour House Sunday afternoon January 13, 1895. A weekly prayer meeting was also organized. Miss White, after a week of work among the people, left to join the work at Long Eddy, N.Y. During March she returned and again commenced the meetings, they being held now in the district School House which was kindly opened to us by the trustee R. W. Lord. During these meetings and by her house-to-­house visitation, she was used by God in bringing many into the fold of Jesus Christ. After laboring several weeks, she went to the French Woods with similar success. Before leaving she organized and put into running order a weekly meeting held for the study of the Bible. This meeting and the prayer meeting are still held regularly. The converted people were imbued with the desire to organize a Church Society and build a church. The money being raised in various ways during the year for that purpose. 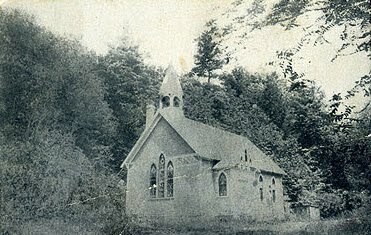 On May 13, 1895, notice being given previously, The Protestant people of Lordville, N.Y. met in the School House and took a vote on which denomination they preferred. The vote when counted showed that the majority of the people preferred a Presbyterian Church. It was decided to call the new church "The Lordville Presbyterian Church'. They also elected three trustees and had the article of incorporation recorded in the County Clerk's Office in Delhi, N.Y. May 16, 1895. The legal part of the organization now being completed, the people desired to perfect the spiritual part of the organization. Rev. John McVey of Binghamton, N.Y., Stated Clerk of the Presbytery of Binghamton, was written to in regard to Joining this young Church to the Presbytery of Binghamton and also in regard to the election of rating elders, reception of members. He not being able Just then to help us in the matter, it was dropped for a while. August 12th, 1895 - Rev. W.W. Thorpe of Wappingers Falls, N.Y. a member of the Presbytery of North River, N.Y. being in Lordville, he was requested to hold a meeting to receive members by letter and by profession of faith. August 16th, 1895 - a meeting was held at which Rev. W.W. Thorpe presided. He preached a very eloquent and strong sermon from the text found in John 3:16, “For God so loved the world that he gave his only begotten Son, that whosoever believed on him might have everlasting life." After this sermon, he received all who wished to join. The newly made members elected Three ruling elders, T.C. Thorpe, John Curry and J.H. Timpson. The rotary system of eldership was adopted. Rev. Mr. Thorpe also held at close of meeting, a communion Service and this beautiful service never seemed so impressive as it did at this, the first communion of the new church. The Church, feeling they needed the care of Presbytery, sent a request to the Presbytery of Binghamton that they send a committee to look over the ground, review the work already completed and if satisfactory, recommend the reception of our church as a member of the Presbytery. They kindly appointed Rev. John McVey, Rev. D.N. Grummon and Rev. G. Parson as a committee to come to Lordville and regularly constitute the church and review the work. He then asked the members if they still confirmed the election of elders previously held, and then proceeded to ordain Mr. John Curry as an elder, the others having been ordained by Rev. Mr. Thorpe. He then spoke a few very kind and helpful words to the new Church Members and Officers - then declared the Church as being regularly organized. Tuesday, September 17, 1895 - The fall meeting of the Presbytery of Binghamton convened at Conklin, N.Y. at this session, in reports of committees, the matter of the organization of the church at Lordville came up and Presbytery unanimously sustained the action of the Committee and accepted gladly the Lordville Presbyterian Church as one of its members. The organization starts off under very favorable circumstances and we hope in a short time to have a church building in which we can worship God after the dictates of our hearts. May the God of Peace, bless us and be with us in this our work.